The ripple effect of LeBron James' move to Los Angeles is more like a series of tidal waves. Sure, the Golden State Warriors remain commanding favorites over the league, but this season our Basketball Power Index (BPI) preseason projections paint a different picture of the NBA -- and many of the changes can be attributed to James' departure from Cleveland. The Los Angeles Lakers, with James at the helm, have a 5 percent chance of representing the West in the NBA Finals this season. That might not sound like a ton, but it's their best chance to pull off the feat according to preseason BPI since the 2011-12 season. And James' move has sprung opportunity in the East, while the West has become more crowded. But before we dive any deeper, let's step back for a minute. You can read more about how BPI is calculated here, but do know this: This is our predictive metric that rates every team by how many points per game better or worse it is than the average NBA team. Those ratings (below) allow us to simulate the season and postseason 10,000 times, which results in our projections. So back to Los Angeles, where the King has made the Lakers relevant again. In the early days following James' signing, the cast of characters that will surround him in purple and gold was considered weak and unorthodox enough that folks wondered: Are the Lakers even going to make the playoffs? To that, BPI has weighed in fairly convincingly and given L.A. an 88 percent chance to reach the playoffs. However, no James team in the past decade has had worse than a 99.8 percent preseason shot to make the playoffs. The Lakers' 40 percent chance to reach the conference semifinals is also a low for James in the past 10 seasons. Yes, Golden State is the most likely team to win the title again this season. And also again, it's a runaway. But then there's this: The Warriors' shot at winning the NBA Finals is 40 percent. That's the third-highest chance among preseason teams to win the title over the last 10 years ... but it's an 18-percentage-point decrease from a season ago. For starters, one input into BPI is Vegas win totals, so to a degree, we're relying on the market. But some more potential answers: Golden State fell short of our expectation of 63 wins last regular season. And once in the playoffs, though the Warriors won the title again, they came dangerously close to losing to Houston. All of that suggests that Golden State is excellent but mortal. To be clear, the Warriors are a superb basketball team. In fact, in the 11 years of preseason BPI ratings, Golden State has the fifth-highest rating going into the season, behind only the 2017-18 Warriors, 2011-12 Heat, 2011-12 Thunder and 2010-11 Heat. We just think a tad less of the Warriors relative to 12 months ago. Just like last season, the team with the second-best chance to win the title is the Boston Celtics. And, despite no major upgrades to Boston's roster (Gordon Hayward and Kyrie Irving were healthy at this time last year), the Celtics' chance to win has leaped up from 12 percent last year to 18 percent now. Two reasons. First, the aforementioned departure of James, which helps free up the East and removes a major obstacle in Boston's path. Second, rising expectations for the Celtics, given how well the team played in the face of major injuries and the breakout of Jayson Tatum. Boston's defensive BPI rating (3.7) has more than doubled from this time last year (1.5). The Raptors have continually fallen short of expectations in the playoffs, but BPI still thinks they are legitimate contenders -- especially now with Kawhi Leonard on the roster. Toronto's 10 percent chance just edges out the Rockets for the third-best shot at the title. And even though the Rockets came oh-so-close to getting past Golden State last season, 10 percent isn't a bad projection considering the in-conference foes Houston faces. This is the Rockets' best preseason chance to win the title as far back as BPI goes -- the 2008-09 season. Just as James left the East, the conference is finally on the upswing. Last year in the preseason, the Western Conference had a 77 percent chance to win the NBA title, according to BPI, which was the greatest chance either conference has had in the past decade. This year the Western Conference has only a 60 percent chance to win the title. Also a season ago, the two best teams in the East (Celtics and Cavaliers) ranked fourth and sixth in BPI, while this season the two best teams (Celtics and Raptors) rank second and fourth. 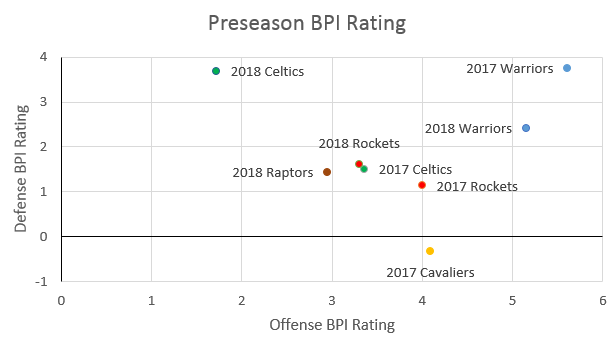 On top of that, the Raptors this year (a 4.3 BPI rating) are almost as good as the Celtics were last year (a 4.8 BPI rating). BPI actually didn't think a ton of the Cavs a year ago, and in the plot here we can see how last year's and this year's top teams in each conference stack up against each other. In the old NBA draft lottery system, the three teams with the worst regular-season records were given lottery odds of 25 percent, 19.9 percent and 15.6 percent, respectively, to receive the No. 1 overall pick. Going forward, the three teams with the worst regular-season records will all receive a 14 percent chance. The team that ends the regular season with the worst record this season will receive only 56 percent, about half, of the pingpong balls the worst team in the league last season received. That is a significant drop-off. The bottom three teams in this upcoming draft lottery will all have worse odds of getting the No. 1 pick than the third-worst team last season (15.6 percent chance). For example, this year the Atlanta Hawks have the best preseason odds of landing the No. 1 overall pick in the draft lottery at 13 percent. Last year, they had the second-best preseason odds of landing the No. 1 overall pick at 15 percent. Given the new distribution of lottery odds, the race to the very bottom has become the race to be somewhere at the bottom. What's the point of a shameless tank job that starts in October if your reward is only a 14 percent chance of getting the No. 1 overall pick?